Here's A Really Easy Way To Install Scripts On Your Websites – Even If You're A Complete Beginner! 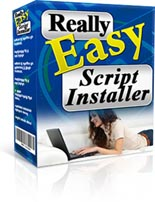 But now with our brand new Really Easy Script Installer, just about anyone can install scripts by just filling in a form and clicking a few buttons. Step 1: Create a folder on your PC and unzip the script zip file into the folder. Most people find this step quite easy. Step 2: Almost all decent scripts use an SQL database, because SQL databases are the only reliable way to store information. So you need to create an SQL database on your web host. This is often the most problematic step for new webmasters. Step 3: Set up the script "config" file to include details of how you want the script to operate. Many quality scripts, such as the ones we sell, come with a special setup tool. You just fill in a short form and then the setup tool creates the config file automatically, making this step very simple. Other scripts usually include a config file in the script zip and require you to edit the file using a text editor, which is a little more difficult, but still not that hard. Step 4: Upload the script to your web host. As you can see, it's not rocket science, but a surprising number of people are unable (or unwilling) to install scripts. And surprisingly even experienced webmasters often make silly mistakes, particularly with step 2. Really Easy Script Installer simplifies the process by automating step 2 (creation of the SQL database) which is the most common problem area. It also provides assistance with steps 3 and 4, to make the whole installation easier.